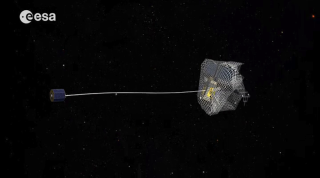 This capture concept being explored by the European Space Agency's e.Deorbit system study for Active Debris Removal capturing the satellite in a net attached to either a flexible tether (as seen here) or a rigid connection. A new European proposal to get rid of space junk adds to a growing list of ideas to get rid of the manmade pollution currently orbiting the Earth. Called e.DeOrbit, the debris-hunting spacecraft would zoom to a polar altitude of between 500 and 620 miles (800 and 1,000 kilometers) and then approach a piece of debris. After using sensors to move in close, it would then capture the junk in some way, perhaps using a net, or harpoon, or tentacle. The CleanSpace initiative from the European Space Agency is just one of several proposals to get rid of space junk, however, with other ideas ranging from lasers to electrical currents to even air bursts. As engineers work through the technical issues, week by week the issue is growing. There are in fact an estimated 500,000 pieces of debris of all sizes, NASA stated, ranging from paint flecks all the way up to derelict spacecraft. Any of these can be deadly to other spacecraft as they speed at up to 17,500 mph (28,160 km/h). NASA occasionally needs to move the International Space Station out of the way in order to dodge space debris. This illustration depicts the amount of space junk currently orbiting Earth. Scientists estimate the total number of space debris objects in orbit to be around 29 000 for sizes larger than 10 cm, 670 000 larger than 1 cm, and more than 170 million larger than 1 mm. The ESA proposal is not quite ready for primetime, but will be discussed at a symposium in early May in the Netherlands. Designers are grappling with problems such as the large amounts of fuel that will have to be carried on board, and how to get a possibly tumbling target under control. The e.DeOrbit joins several other types of space debris removal proposals. A Swiss mission concept called CleanSpace One would zoom into space from the back of a modified Airbus A300 jumbo jet, if it goes forward as planned in 2018. The Japanese Aerospace Exploration Agency is reportedly considering an electrodynamic tether, and flying a part of the mission later this month. Other proposals would use slingshots, air bursts or solar sails to capture errant space junk.